I’m scared of a lot of things. I am basically a fair weather, soft adventure enthusiast which is why among many things I’m terrified of crocodiles. I love seeing them, just obviously don’t want to risk swimming with them! So far I haven’t really swim at the base of the ‘crocodile management area’ waterfalls in the top end because they’re deep and dark and I have an over active imagination. And i know I’m not alone with these fears! 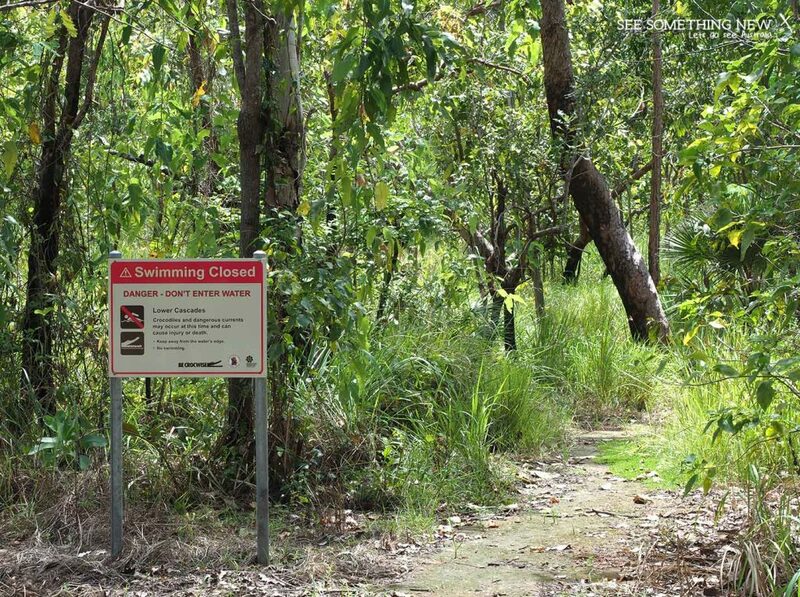 So i was starting to wonder if I was ever going to get a chance to have the quintessential ‘wild swimming’ experience while living in the top end. You know the one, the Instagram photo with someone draped on a rock or lazing around in the water with mates with some beautiful tropical swimming hole or waterfall backdrop! But on Friday I finally got to have my first taste of swimming in the top end, courtesy of Litchfield National Park, and it was blissful! There are two cascades areas in Litchfield, the Upper and Lower cascades. In the dry season you can walk past both as a loop but as its April, the lower area was closed for the wet season. This is because of the high risk of crocodiles moving into the area (they pulled a large one out of there a couple of years ago). However luckily the Upper Cascade walk was already open for the upcoming dry season so that’s the one I did. It’s about a 3.6km return walk and while thongs were the footwear of choice for most people, I struggled with my slightly bad ankle in hiking sandles and wished i had my boots. The upper cascades walk is classified as a moderate walk as there is quite a bit of steady uphill climbing. The surface is loose and uneven most of the way up through the rock escarpment with natural rock steps in some places. 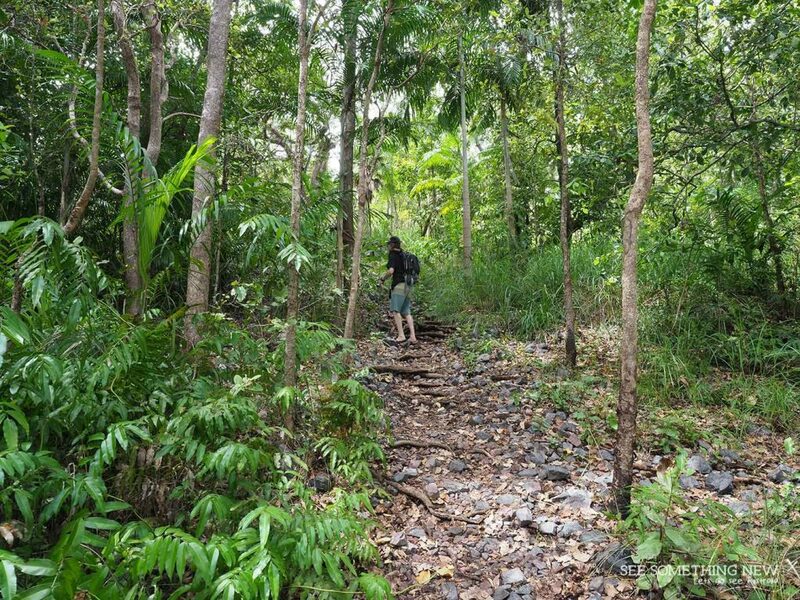 The walk starts off flat with some viewing platforms over what I can only assume is a seasonal flood plain and then you slowly start to climb up through a small patch of Monsoon forest. It gets surprisingly humid in these areas because despite the shade there is not a breathe of air but it is pretty and green to walk through. From here the walk becomes a steady uphill climb with lots of loose rocks most of the rest of the way. 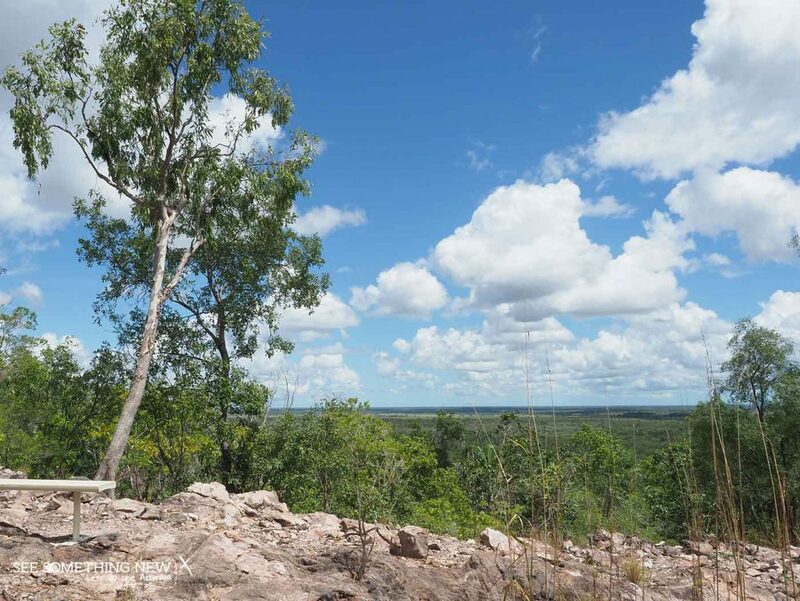 Once you gain enough height there are lookouts on to the vast green lowlands of Litchfield, with the contrasting blue and greens of sky and land quite spectacular in the bright sun. There is very little shade for much of the walk (about 1 km in each direction) as the vegetation up on the escarpment is open, so make sure to pack a hat and bring plenty of water. Finally you start to hear the sound of water falling over rocks and after crossing a natural creek line (it was dry when we visited) the track starts its short decent down to the cascades. The track runs straight an area of land which has flattened out to a little gully with a series of cascades. To the left is a tessellated section of rocks flowing down to the lower casades further downstream at the bottom of the escarpment (not a swimming area). To the right is a series of cascades and water holes. This is the area where people were swimming. The pools are shallow and clear, with some deep enough to swim while others are the perfect depth to enjoy sitting around on the shallow base. I’m not a super fit person (I’m working on it but I’m about 30kg overweight) so this is a great walk for a bit of challenge if your trying to get fitter or a beginner bushwalker. There was also lots of families who tackled the walk together. I would highly recommend doing most walks over a couple of Kms in the coolee temperatures of morning or later afternoon and I certainly wished we got going earlier. We walked in the middle of the day so it was very hot and needless to say by the time i got to the top I was hanging for a swim and feeling a bit hot. In fact I may have just taken off my shoes and jumped in clothes and all! I liked the cascades because there are nice shallow spots to swim with a sandy bottom so you can just laze around in the water and cool off and chat with your bushwalking buddies. The water was refreshing but definitely not chilly like it is down south in Australia! After 40 minutes or so I reluctantly dragged myself out of the water. Needless to say the walk back was a lot more comfortable in nice wet clothes. 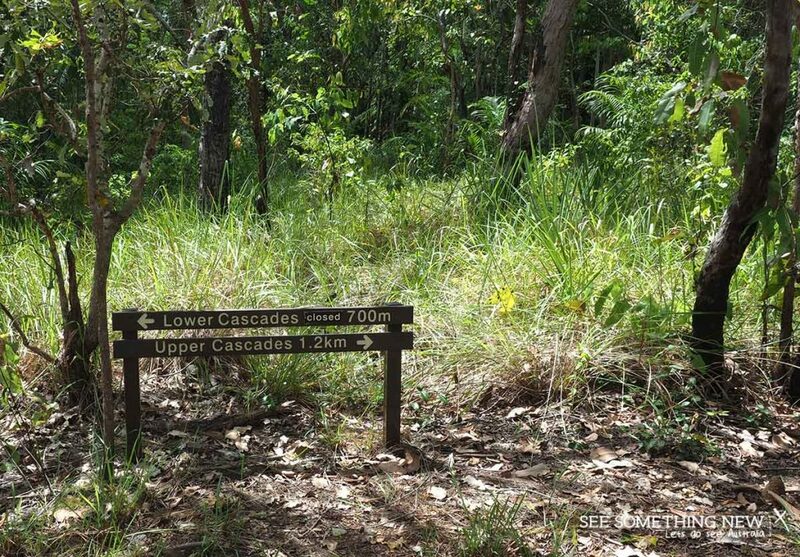 I would highly recommend the Upper Cascades for a good short bushwalk as it has a taste of everything from a little bit of monsoon forest to lowland views, some challenging uphill climbs and a rewarding swim in nice shallow pools at the top! And of course being able to see the bottom is comforting if your paranoid like me! Want to remember this walk for you holiday? Pin it to Pinterest now! 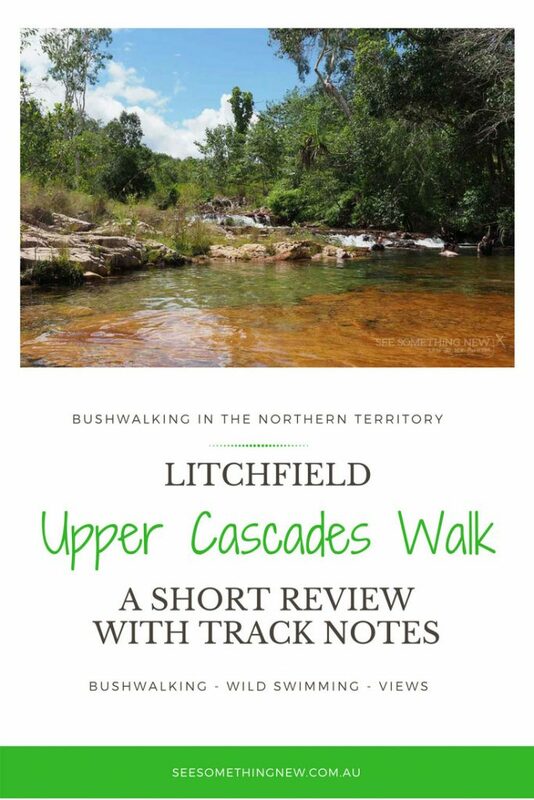 Litchfield National Park is managed by NT Parks & Widlife so visit their site for up to date information on access, safety, swimming and walking tracks. Litchfield is just under one and half hours drive (120km) from Darwin. Batchelor visitor information centre is a good place to stop for park notes and information on whats open, particularly in the wet and shoulder seasons. There is also an alternative entrance to the park via the Litchfield Park/Cox Peninsula road in the dry season, you can check the NT Roads report prior to visiting to see if it is open. 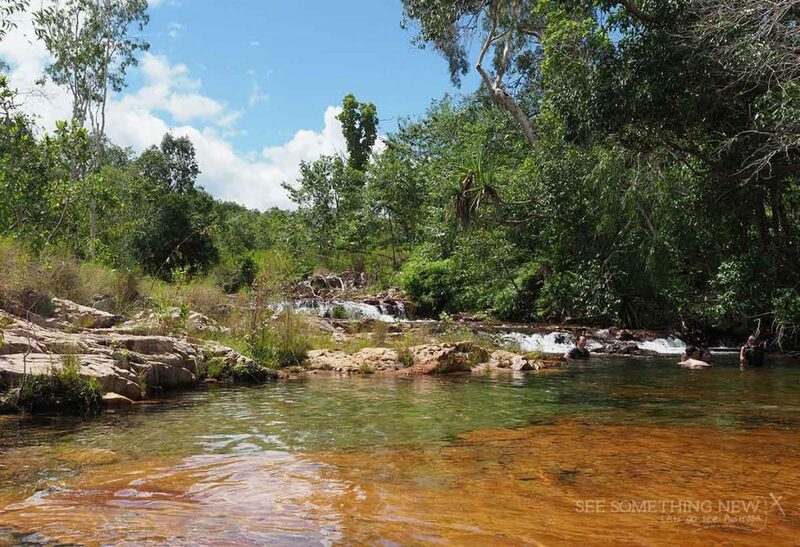 The Upper Cascades are considered a ‘Low Risk’ crocodile area by NT Parks and Wildlife. Crocodiles can move undetected into an area at any time. It’s a topic that can’t be avoided in the top end, crocodiles are a reality and you need to make sensible choices. 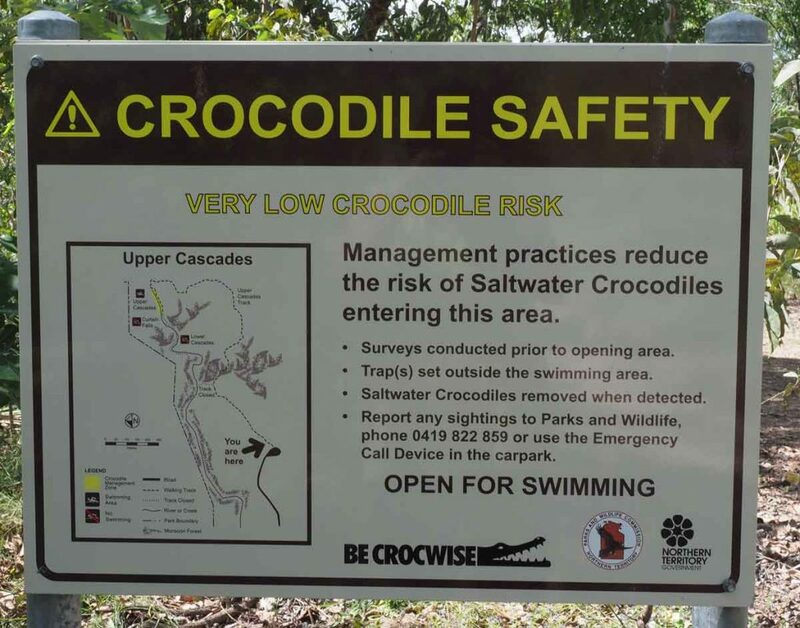 Swimming is always a personal choice and an area is never ‘Guaranteed’ crocodile free. NT parks and wildlife calls their crocodiles control swimming spots ”Low crocodile risk areas’ while Parks Australia over in Kakadu says the only guaranteed safe spot is a swimming pool. To learn more about being ‘Crocwise‘ visit the NT parks website. Heat and dehydration causes far more harm than crocodiles in the top end because people don’t take pay as much attention to the risk from the sun as they do to crocodiles! Always hike prepared with water (about a litre per hour per person), a hat, sunscreen or cover up with clothes and try and avoid the warmest parts of the day. You may like to consider that its much better for the environment at swimming holes if you cover up rather than use sunscreen and insect repellent. Especially if they are no longer flowing. Add the Upper Cascades Walk to your Trip Planner (currently in testing stage).